5 reasons to visit Ikaria, a case study for a simpler, healthier lifestyle. Although only an hour’s flight from Athens, Ikaria has an architectural, social and natural morphology that makes this northern Aegean island stand out from its neighbors. 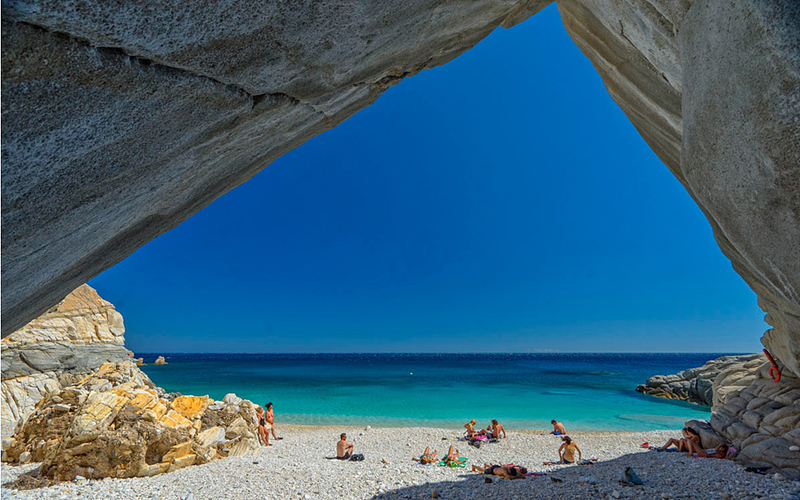 The lengthy, healthy life of its inhabitants is scientifically comparable to that of people in only three other places in the world, fueling Ikaria’s appeal in the esteem of some of the world’s most discerning and sophisticated visitors. Definitely not fancy or glamorous, the island is a treasure trove of natural beauty and pure food, with an idiosyncratic rhythm that can be danced to throughout the day – or night. 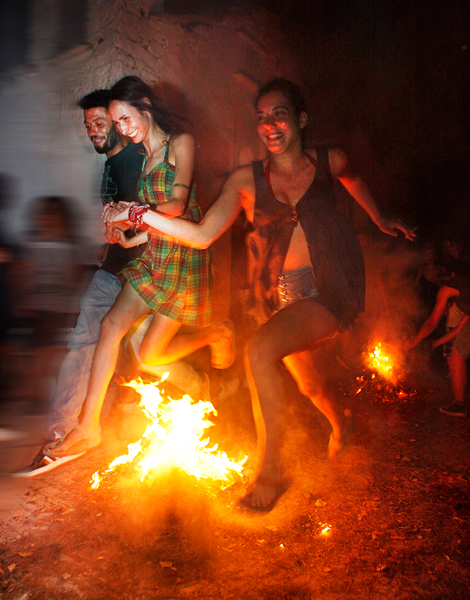 The locals love to party, so expect yourself to be roped into the fun! 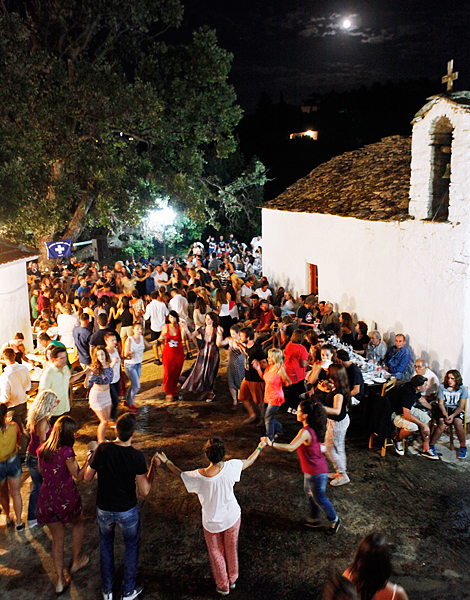 One of the most appealing and special aspects of the Ikaria experience is getting to know its unique people. The islanders are often described as highly self-sufficient and physically disciplined, as they dedicate most of their day to tending their land and animals. Yet, at the same time they are bon viveurs who know how to live life to the full and completely in the present. Although philosophically minded, creatively inclined (there is an especially resilient passion for music across the island) and definitely able to take a joke, they’re essentially simple people who are satisfied with the little they’ve got – a fruit and vegetable garden round the back of the house, a community bound by loyalty, individual independence, the ability to follow a daily rhythm that suits their reality, and long-honored equality between the sexes (a rare find in provincial Greece). They are not thirsty for money or fame, and despite being warm and welcoming to visitors, they feel no need to turn their island into a polished tourist destination that changes to accommodate other’s needs. And ironically, this characteristic only serves to make them more alluring. 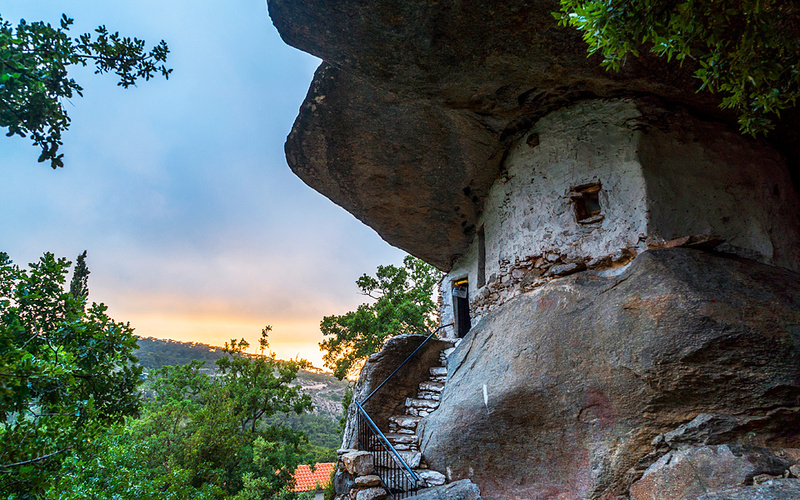 Part of the island's monastery is the small chapel of Theoskepasti which is built under a gigantic rock. Authentic, pure, organic, seasonal and straight from the garden is how Ikarian cuisine can best be defined, as throughout the island locals grow fresh produce in great abundance, while the wild “rasko” goats roam free, feeding on wild greens. Goat meat, milk and cheese are all staple foods, while in the coastal areas such as Armenistis, Nas and Evdilos you can stop for a bite of seafood with a view. The capital, Aghios Kirykos, and the Fournoi islands across from it are best for lobster. There are three wineries (hyperlink to my piece) producing quality, award-winning wines on the island. All located in very scenic spots, they offer a great excuse for a relaxed wine-tasting tour, although at most places you stop to eat, and particularly at local festivals, you will most probably be sampling the potent (15 percent alcohol content) red hima (non-bottled, locally produced) wine. In recent years a handful of restaurants on Ikaria have started serving more modern and creative dishes, often with exciting results, but overall the food is traditional and simple. Local specialties include soufiko, the pan-fried Ikarian rendition of briam (Greek ratatouille); spongy, white kathoura goat cheese and giant zucchini. Wild herbs are added to all dishes and brewed as tea (water mint or fliskouni being a popular choice), lashings of olive oil on everything and common use of excellent, medicinal honey (white heather, pine tree, thyme, strawberry tree). Mostly blanketed in thick, verdant foliage throughout the year, predominately mountainous Ikaria is a delight to explore on foot or by car. Mapped walks in Natura 2000 areas such as the 25km Ikaria on Foot circuit trail immerse you in the beauty of gorges such as Halaris, with emerald-green lakes, cool steams, lush forests, waterfalls and paved donkey paths. There are also several organized botanical tours (Ikaria has 1,100 endemic plant species) and food-foraging walks along the island’s paths, led by experienced local guides. Ikaria has also been named an important bird area: keen birdwatchers can enjoy spotting the peregrine falcon, Bonelli’s eagle and, closer to the coast, the sea raven, among other species. The rare lizard species Lacerta oertzeni and Stellagama stellio (or korkofylas to the locals) can also be found here. For aquatic pleasures, beaches like Nas, Faros, Seychelles and Armenistis are the most popular due to their invigorating crystal waters and aesthetic allure. 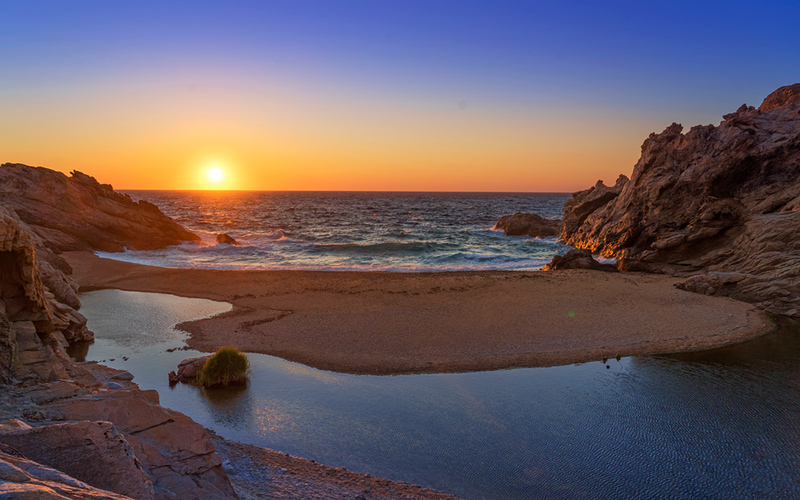 Ikaria’s eight hot springs, which are said to be among the most radioactive in the world (but all very safe), have since ancient times been lauded for their curative properties that help treat rheumatic, skin, gynecological, respiratory and neurological ailments. The springs at Therma, Aghios Kirykos, Lefkada and Aghia Kyriaki have attracted visitors for millennia. In ancient times the people of Therma were called Asclepians after the god of healing Asclepios, while near Therma some ruins of the ancient city can be explored underwater. Modern health tourism based around the island’s radium-rich springs started blossoming in the 1920s and remains popular, with organized spas, hotels and hydrotherapy pools offering sessions in the water combined with massage and more. Talking of springs, Ikaria is also known for its “immortal water,” a cold spring near the village of Xylosyrtis that is thought to be beneficial for treating kidney ailments.